Want to get back into sport? Or to take up a new one? Or just looking to meet new people? Come and meet some of the 40+ LGBT+ sports clubs in London, hear more about what they do and where they train, and how you can get involved. There are opportunities for people of all abilities, for total beginners, and for both casual and competitive sports. There will be an open bar for the whole of the event, and feel free to bring your friends! 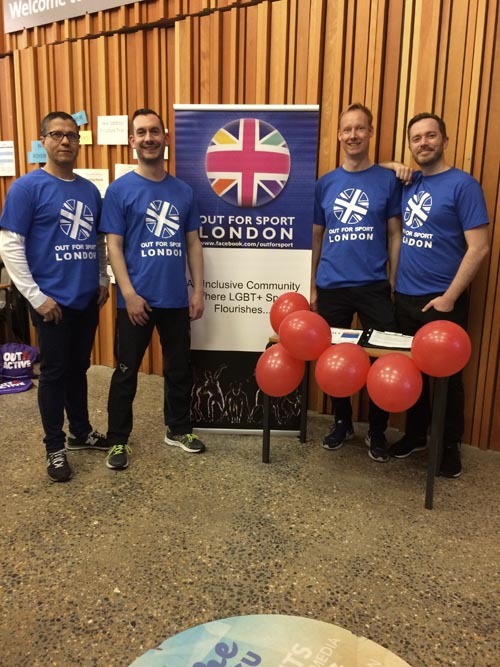 Out For Sport are hosting The LGBT+ Sports Fair in partnership with SONET @ London Southbank University. 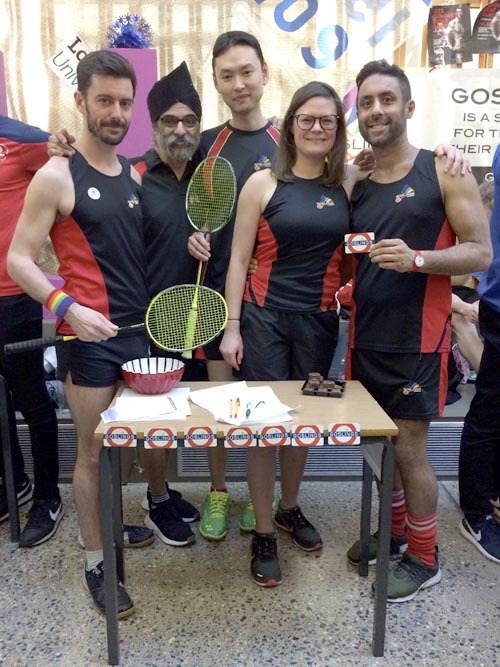 We will be joined by more than 25 of London’s friendliest LGBT+ Sport Clubs sharing information on their membership and events, plus representation from Pride in London, and the Federation of Gay Games (Hong Kong 2022). Remember that time we had a good luck message from the Prime Minister?! Ahead of the Gay Games in Paris last year, Prime Minister Theresa May sent all of those representing the UK a message of good luck. On behalf of the whole United Kingdom, I would like to wish all of you the very best of luck for the 10th Gay Games. You are an inspiration for the LGBT community and, for that, you should be extremely proud – just as the whole country is proud to have you representing us in Paris this week. We had a fun and interactive training evening on Wednesday 23rd January. Dimitri Spiliotis who is a counselling psychologist who works at Barts with a specialism in HIV and sexual health then led a session on mental health. The session helped us to understand different mental health conditions and we discussed how it might feel to have a condition and how we might best be able to be welcoming as a club. For winning swimming top team with twice as many points as the second placeteam, by having Waterpolo, Synchro and Open Water teams and for being a great mix of ages and genders, by great team spirit, by being frankly fabulous. Team LGBT+ We finally someone looked like a united group! For their amazing costumes; beautifully creative outfits with floats, sequins, diamanté, tassels & all! Pink Dancers in the Showdance competition – 1950s Parisienne – were fantastic. London Orca & London Otters Who got plenty of votes from thirsty gays on account of their kits. Loudly cheered on every other teams’ boat. They also supported organisers before and after the competition to rig boats and de-rig boats that were supplied by the organisation. Elizabeth Bellinger Swimmer who competed in the women’s 40-45 age group and SMASHED a number of IGLA records. Her 100m butterfly was truly exceptional. She swam it in 1min 6 seconds which is RAPID by any standards. James Wilson Winning gold in rowing and gold in squash. Which INDIVIDUAL gave the prettiest performance? ‘this is me’ the whole venue exploded and cheered. Michal Litke & Mariusz Staniewiez Dancesport: Became Vice World Champions in Ballroom, standard dance in a stunning blue outfit with peacock decoration, peacock feather bowties & diamanté on their shoes. Dan Westley Such a Graceful Hockey player for a bigger guy! For all his work with Out for Sport, and working with the organisers of the Dancesport event & being compere for the four long days of competition and keeping his cool. Christophe Donot For Out To Swim- he organised almost everything- accomodation, accreditation collection, directed the winning Pink Flamingo performance and even competed in individual/relay events with a fractured rib- dedication! Alex Jones of LORC for organising and managing the trip for nearly 80 LORC members. For their derelict fancy dress, which left very little to the imagination and drew gasps of horror and admirations from passing Parisiens and tourists on the Left Bank. Which UK participant/team was the star of the most ridiculous photo? Penny Johnson Dancesport: ‘lippy’ – 48 degrees, in full outfit, makeup & ice towel; trying to keep cool & look good! 19 people registered to attend and 11 made it to the event. Women In Sport did a great presentation which was well received. Matt Hill presented about the Hockey Women and how they managed to recruit for their teams. We had interesting discussions. We did a quick survey monkey afterwards to ask for feedback most questions getting 5 out of 5. Below are some quotes from the survey. The presentation was interesting, if perhaps a bit too long for us. The discussion section was very lively with some good ideas about getting your club noticed. Thames Dragons revealed themselves to have some top ideas, ideas such as a special Breast Cancer awareness event – as paddling is very good for recovery from surgery. Xander’s presentation, which ran through how to decide what money you need and then where to look for funding sources was very interesting and people asked a lot of questions. Kings Cross Steelers did a presentation on how they had fundraised in the past and this was also well received and lead into a general discussion about raising money. We plan to carry on and run more training events in the future which might cover topics such as Data protection and Good Governance. Bringing the clubs together to learn about good practice, debate issues and learn from other similar clubs is a excellent way to develop relationships between the clubs. 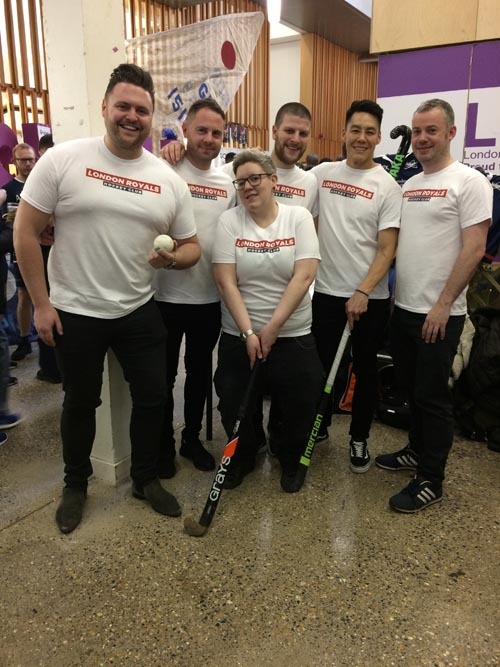 CALLING ALL SPORTY QUEERS – Starting this summer a new queer community sports club will be organising weekly rounders or netball sessions in north London for £1 a session! The sessions are open to women and non-binary queers and the first session is on Monday (sorry gents….if you’re looking for sporting opportunities for cis gay men, we have a fine selection here). Full details can be found in the flyer to the right. Queerballers also have a Facebook page. If you’re interested please use this link to sign up – https://goo.gl/forms/H0rqzcdnKPaMxph32 – or if you have any questions, contact queerballers@gmail.com. 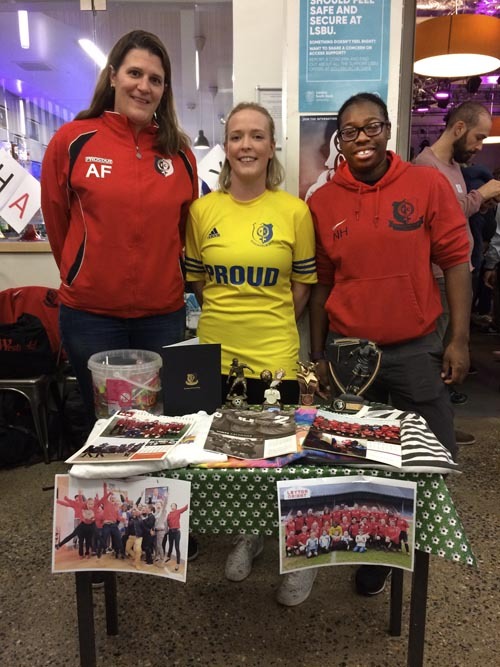 We recently held another successful LGBT+ Sports Fair in partnership with London South Bank University. The curse of Friday the 13th might have played mischief with the sound system, but that didn’t dampen the atmosphere as more than 300 people packed out the LSBU Student Centre to meet the 25 clubs. The party kept going until midnight, so hopefully many of you found new sports, new friends, or new connections with other teams. There were also some great suggestions for what we might do to build some ‘Team LGBT+’ spirit ahead of the Gay Games in Paris, whether we should do a similar event aimed specifically at women, and how to make the most of our Out & Active program for older people. 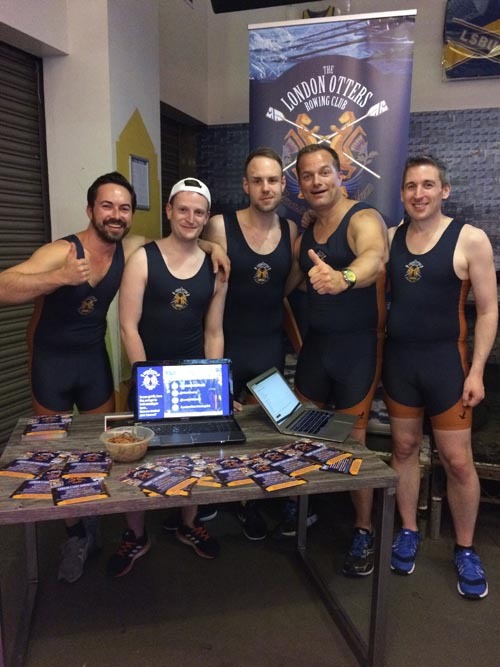 For those of you who couldn’t join us at the fair, you can find all the LGBT+ sports club websites here. Out To Swim invites all London LGBT+ sports clubs to join them at their summer boat party! Three decks of extravaganza eleganza, drinks and dancing. Casting off from Tower Pier, the party boat will head up river to the Tate before cruising down to the Cutty Sark and back again, all under the musical stylings of our onboard DJ. Each ticket includes admission, a welcome drink and further 1 x drinks token* that can be exchanged at the bar. So renew that appetite for Aperol, dust off your best vest and join us for the hottest LGBT+ sports social event of the summer! Please note: The boat party will not be stopping until reaching final destination at 1am. There will not be any opportunity to alight en route. Our glorious leader, Vicki Carter has been recognised by LEAD as an Unsung Heroine – part of their campaign to mark International Women’s Day 2018 by celebrating those women who go above and beyond to help others without being asked. Click below to read a bit more about why Vicki was nominated. 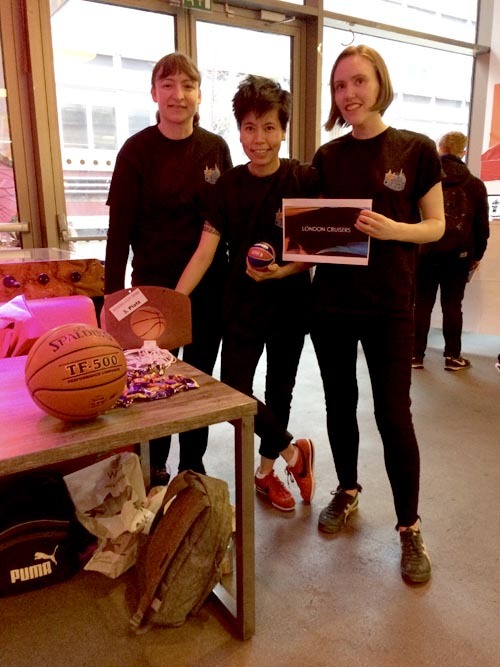 Vicki also recently took part in the 1000 Londoners project during a workshop at London Sport, and talks about how she got into LGBT sport originally…and recalls her first Gay Games in New York in 1994 and what that meant to her. Well worth a watch here. Well done and thank you to Vicki, and to all the women keeping LGBT sport clubs surging forward.